INDIANAPOLIS -- Sometimes it's the littlest of things that shows a sign of life. In this instance, it was a strip of the ball and the All-Star on the team with the Eastern Conference's best record sprawling his body out and diving to the floor for possession, not worrying about leaving any skin behind on the ground. That was necessary for Paul George and the Indiana Pacers, as their season and some jobs were on the line -- yes, on the line -- in just Game 2 of their playoff season against the Atlanta Hawks. Brian Spurlock/USA TODAY Sports Frank Vogel welcomed a Paul George performance that energized the Pacers in Game 2. Leaving it on the floor -- the same way they did during the first half of the season -- was how the Pacers were going to beat the Hawks. Trying to cut corners the way they've done in recent weeks wasn't working. George's aggressiveness on defense and confidence on offense helped the Pacers beat the Hawks 101-85 and even the series 1-1. "We couldn't go down 0-2," Pacers forward David West said. "It was a situation we couldn't let happen." Tense was the last thing the Pacers wanted to be during the game. They learned what happens when you play that way during Game 7 of their Eastern Conference finals loss to the Miami Heat last season. There's no denying the pressure was there on Indiana no matter how they tried to spin it. But rather than let it eat at them, causing them to overthink and get out of their comfort zone, they remained loose and were even joking around before the game. The Pacers knew what had to get done. They just showed their desperation in other ways. Pacers coach Frank Vogel making the move that everybody had been waiting on by putting George on Hawks point guard Jeff Teague and going with the backcourt combination of George Hill and C.J. Watson to provide quickness on the perimeter. Hill playing like he cared again by attacking instead of being passive. The bench, the one Pacers president Larry Bird made a concerted effort to improve last summer, gave the Pacers a major lift with Watson and Luis Scola. "I think we looked like the old Pacers team from the beginning of the year, very active on the defensive end and moving the ball on the offensive end," Hill said. "All the guys out there were great tonight, from the starters to the bench players." It all started and ended with George. 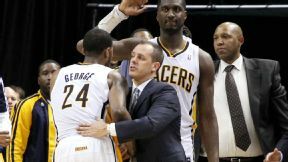 Vogel had to make the adjustment of putting George on Teague, who scored 28 points in Game 1. That's how the Pacers have always used George, going back to his rookie season when he was matched up on Chicago's Derrick Rose in their first-round playoff matchup in 2011. Teague had a quick seven points, five rebounds and three assists in the first quarter. He let George know about it, too, by talking trash. That got George going, which in turn got the rest of the Pacers going. George went from worrying about being flashy with the ball, to being in attack mode on both ends of the court, similar to the way he looked when he was mentioned in the MVP conversation with LeBron James and Kevin Durant at the start of the season. George finished with 27 points, 10 rebounds, six assists and four steals. And Teague after his quick start? George's length and quickness limited Teague to 3-of-8 shooting, no rebounds, one assist, three turnovers and just seven more points in the final three quarters. "He always does those types of things, guarding the best perimeter player, his hands all over the place," Vogel said. "It makes him one of the most complete players when he plays like he did tonight." The third quarter was a flashback to when the Pacers were NBA darlings and everybody talked about them because of their defensive intensity and unselfish play. The Pacers held Atlanta to 25 percent shooting and Hill's 10 points helped the Pacers outscore them by 18 points in the quarter. "We put the print on this game in the third quarter, which we've [done] playing November, December and January basketball," George said. "I thought we did a great job of really just locking in coming out in the second half on what we needed to do." George sealed the Pacers' victory when he sank a 28-foot 3-pointer and promptly walked toward the Hawks' bench and yelled "This is my house" toward the energized crowd. The 3-pointer prompted half of the Pacers' bench to sprint the length of the court and join in the celebration with George. "I just wanted to let everybody know we weren't going anywhere and we were going to keep fighting," George said. That's exactly what George and the Pacers did. MVP: When the Wizards needed it most, Bradley Beal put them on his back. Chicago built a 10-point lead with just less than seven minutes left in the fourth. Beal then calmly collected nine points as the Wizards closed regulation on a 14-4 run to send the game into overtime. Defining moment: Every twist and turn helped define the game. Washington punched first by building a 17-point lead with about two minutes left in the first quarter. It had to know that wouldn't last, as Chicago returned the punch and slowly chipped away, eventually taking the lead. The reeling Wizards then missed 11 free throws in the second half (5-16), but they made them when they had no other choice, going 4-4 in OT to hold the contest. X factor: Nene Hilario, the hero in Game 1, turned into Game 2's X factor. He didn't start out of the gates like he did on Sunday, scoring just four first-half points. But the Brazilian galloped in the end and all the way into overtime. He sealed the 2-0 series lead for the Wizards by scoring six of his 17 points in the extra session. MVP: DeMar DeRozan's Game 1 struggles followed him through the first three quarters of Game 2. In the fourth quarter, though, DeRozan exploded for 17 points, including nine from the stripe, and finished the game with 30 points. X factor: Jonas Valanciunas' 7-foot frame was a constant problem for the Nets' smaller defenders. He thrashed Brooklyn on the boards, finishing with his second double-double of the series. After an up-and-down season, Valanciunas is finding consistency down low. That was ... loud: The Air Canada Center crowd was in full effect Tuesday, balking at every Toronto foul, jeering Garnett at the free throw line, and blowing the top off the building in the fourth quarter. Now, the Raptors must get it done on the road without their sixth man. MVP: It was a huge performance from Paul George, whose overall line for the night was 27 points, 10 rebounds, six assists, four steals and a block. George had eight points in the game-changing third quarter, when he hit a buzzer-beating 3-pointer to cap off a 31-13 advantage for Indiana. X factor: Luis Scola quite literally saved the Pacers in the first half. Indiana was having trouble manufacturing offense until Scola came off of the bench and hit his first four attempts from the field. Scola finished with 20 points and seven rebounds. That was... crucial: The Pacers could not afford to go on the road down 2-0 in the series. Trailing at halftime, Indiana came out with the fire that it showed in the first half of the season, absolutely shutting down the Hawks on both ends of the floor. Bradley Beal, Wizards: Beal was the real deal in boosting the Wizards to an improbable 2-0 series lead on the Bulls. He sank 4-of-7 3-pointers and hauled down seven boards en route to 26 points and a 101-99 overtime win. Paul Pierce, Nets: Hampered by foul trouble, The Truth went 2-for-11 from the field, including 0-for-6 from 3-point range in the 100-95 loss in Toronto. He finished with seven points and then declared his team was "soft" on defense. "I don't know if you can say 'F Brooklyn' and then come into Brooklyn. So we're about to see what it's like." Claus Andersen/Getty Images DeMar DeRozan jammed his way to 30 points as the Toronto Raptors topped the Brooklyn Nets 100-95. 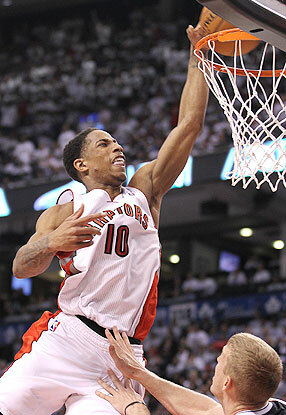 DeRozan scored nine points from the free throw line in the fourth quarter. Toronto's Jonas Valanciunas (32 points, 32 rebounds) is the third player in the past 30 seasons to record 30 total points and 30 total rebounds in his first two career playoff games, joining Ralph Sampson (45 points, 38 rebounds) and Sam Perkins (40 points, 32 rebounds) in 1985.